Come join The HVAC Jerks (Rich, Kevin, and Joe) each week as they discuss everything in the HVAC industry from news and technical stuff, right down to stupid customer stories and how "not to do it". If you work in the heating, air conditioning, plumbing or electrical trades, or hope to in the future, spend some time with us; you'll have a lot of fun, and you might even learn something. In this episode, The Jerks revisit the process of closing a deal in the home, but Kevin's feeling feisty and keeps tossing out roadblocks. Conflict and craziness rule this week's discussion! From fire and burns, to falls to you death, the HVAC world is not one for softies. This week The Jerks relive some of their own close calls in the field with a laugh and the hope that you'll learn something the easy way. Make your commute fun with The HVAC Jerks, then share your own stories with them at theboys@thehvacjerks.com. Episode 26 - Bad manager? Lets talk about it. If you work at all on the planet Earth, you are likely to either have a manager, or be a manager; and that doesn't mean a good one. There are different management styles, including some that are to soft, and some that micro-manage people to death. The Jerks take a stab at identifying different styles and what works or doesn't. And, of course, Anonymous Joe gets assigned another stupid name. Episode 25 - Are you a Closer or a Poser? So, which is it? Can you close the deal? Find out when The Jerks get in to how to close the sale. Rich says that most techs and sales people never even try to close the sale; Kevin and Anonymous Joe may have a different take, as usual. Find out in episode 25! Episode 24 - Why do service companies charge so much? This week The Jerks take a deep look at why service companies charge as much as they do, and more importantly, why it matters to you. Whether you're a technician or an owner, you need to know what it costs to do business. Without a clear understanding of the company's expenses, it's hard to justify the price to the customer, and harder to feel good about it. This is an extremely important topic, please don't miss this one. Find out! This episode was originally released on 3/3, accidentally deleted and reloaded on 3/9. Jerks will be Jerks. In this episode the boys attempt to discuss what technicians can do in the industry when they're tired of turning wrenches. Episode 21 - Professionalism; This is how you do it! Anonymous Joe takes the lead in this week's discussion on professionalism with the Jerks. Perception is reality, especially in the customers' homes, and Fancy Joe knows how to do it right! In episode 20 The Jerks discuss some of the ins and outs of heat pumps, and continue to abuse Anonymous Joe. Episode 19 finds The Jerks trying to uncover the best ways to organize an HVAC installation. They discuss how to make sure the customer gets what they were promised and paid for, and that it is efficient and profitable for the company. Episode 17 - Is ductwork becoming less critical? Most of us understand how a bad duct system can create many problems in an HVAC system, regardless of how well the equipment was installed. In Episode 17 The Jerks talk about common duct problems and how new technologies may minimize some of their effects. This week the Jerks tackle the fundamentals of load calculations; what they are, why we do them, and how they can help us. In episode 15 The Jerks begin the discussion on what it really takes to start and run your own business. Rich, Kevin, and Joe go through the challenges and rewards of giving up the steady paycheck in exchange for being the boss with their unique (read, dopey) flair. Join them and learn something! Episode 14 - Upselling; love it or hate it? No matter what you call it, adding-on, enhancing the sale, or just plain upselling, sales are an important part of an HVAC technician's job. It can be done with the customer's best interest in mind, or with the worst of intensions. Listen to what The HVAC Jerks have to say and make sure that you know the difference. Most of us have had mixed experiences with supply houses; some really good, some horribly bad. The Jerks discuss why contractors get so frustrated with some counter people, and also why the problem is so difficult to fix. Listen to what they have to say, and then tell them why they're wrong! Episode 12 - Does brand really matter? This battle has been going on for a long, long time people. Are you selling an equipment brand, or are you selling your brand? 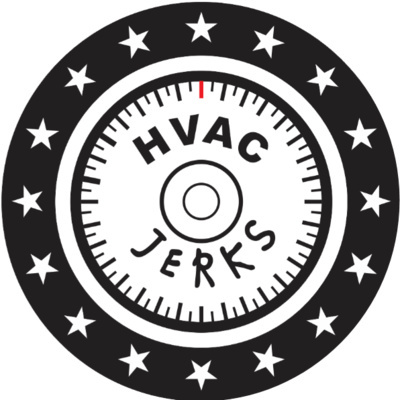 Listen to what The HVAC Jerks have to say, then let them know what you think at theboys@thehvacjerks.com ! And, they've got new music this week, too! The Jerks are back in episode 11 to expose the frustrating boiler mistakes we all see in the field. Kevin gets passionate about bad installations, Anonymous Joe makes fun of him for talking with his hands, and Rich tries to get them to stick to the topic. It's just a circus again. In this episode The Jerks begin the discussion on boilers and hydronic heating, and give Joe an alias for the day. In Episode 9 The Jerks get a little technical and discuss some of the particulars of venting oil and gas appliances. We're sure that there is something in this one that you haven't heard about before, or are unsure of, so join them and have some fun on your way to your next service call, or your next beer (not both). In episode 8 The Jerks read and discuss some of their listeners' emails, such as the differences in working for a large company vs. a small one. But, they're still jerks. This week The Jerks go over some of the "dos and don'ts" of speaking to the customer, including a few of their own stupid stories from the field. And, yes, they're still here! In the 3rd and final part of this series, the Jerks talk about why employee training is important to the customer. It looks like the boys are getting the hang of this podcast thing after all. In episode 5, part 2 of their training segment, the Jerks discuss the importance of employee training from the employer's perspective. The Jerks begin a three-part series on employee training. Part one looks at training from the employee’s point of view, and as usual, they have a hard time staying focused; they really are jerks. Episode 3 - Got gas? In this episode The Jerks discuss the gas utility debacle in MA that caused thousands to be evacuated after natural gas lines were accidentally over-pressurized. In this episode the Jerks relive some of the more interesting and colorful stories of their careers, including one about "Big Poppi".